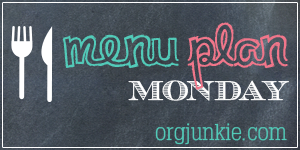 This week’s menu is built around my Eat What You’ve Got Challenge. All the meals and snacks are based on what we’ve already got in our pantry, fridge and freezer. I started the Eat What You’ve Got Challenge after being frustrated about all the food we end up wasting in our house, which also equates to wasted money. The last step of the challenge (you can join the challenge below to get all the details) is to create a menu for the week using only food you already have. Going through my fridge, freezer & pantry I came across some things I didn’t even know we had. It was also a great opportunity to clean out any expired food. I actually had fun getting creative with my menu this week. I also feel good knowing we are wasting less food by using what we have and saving money at the same time.